Compassionate and capable, it is Ellen who rescues and saves Charles after his collapse in the snow. She is kind hearted enough to take the risk of sheltering this ill stranger — despite being alerted to the risk that he might be carrying rabies – yet level headed enough to keep Charles in chains until she can be sure that he poses no risk (and to restrain him, if in fact he does). Although not seen on screen, she has taken Charles into her home after being alerted to his presence in the fields outside by the anxious Ron. Her resourcefulness is evident not just in her ability to run the farm with only the aid of [the challenged and challenging] Ron, but in the way she interrogates Charles over the possibility of his infection. Her empathy and humanity is confirmed by her willingness to share her home with the hapless Ron, a character likely to have been shunned by others less tolerant of those more vulnerable than themselves. 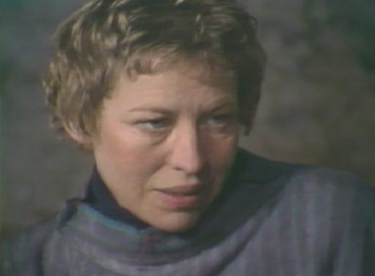 Even as she hides Charles away she does not criticise Sanders' gang for trying to hunt him down — she accepts that their motivations are perfectly understandable and rational, although she knows that in the pursuit of self-preservation they may take things too far, and put to death a stranger who in fact poses no threat to them. There seems little doubt that the assured and self-possessed Ellen will deal quite effectively with any recriminations that follow from her harbouring of the wounded Charles.